A holographic weapon generates a visible red laser in the form of a reticle and projects it onto a prism. The reticle appears in the shooter’s field of view and is superimposed over a target. Even if the shooter’s point of view changes relative to the sight, the reticle appears in the same spot on the target. This is a key benefit of holographic sights, as the shooter’s line of sight does not have to be perfectly aligned with the weapon’s sights to accurately place the reticle on target. The short video below does a good job of demonstrating how this works. Notice that even as the camera moves around, the reticule stays on the same position on the target. When a holographic sight is correctly calibrated and aligned, the rounds fired from the shooter’s firearm will impact the target wherever the reticle is positioned. This concept was first employed by the US military in the late 1970s as the Armson OEG. It was later distributed in the US by the company that would become Trijicon. The Armson sight gave shooters the benefit of keeping both eyes open while aiming so as not to contribute to a condition known as tunnel vision. With a holographic sight, the shooter could keep both eyes open to scan for additional threats. Other sight systems, including the popular red dot types manufactured by Aimpoint, were based on this concept. However, these sights projected the red dot within a tube similar to a rifle scope and did not fully solve the issue of enabling the shooter to keep both eyes open. 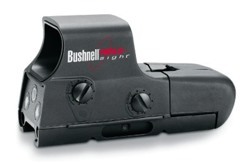 This changed in the early 1990s when scope manufacturer Bushnell debuted a model known as the Holosight. This was the first true holographic weapon sight and was marketed at first to hunters and target shooters. The key benefits were the abilities to keep both eyes open, quickly acquire a sight picture and be completely parallax free at any distance, angle or direction. Parallax refers to the apparent movement of the reticle of a scope in relation to a target based upon the movement of the shooter’s head or eye in any direction. As an added bonus, the Bushnell Holosight was powered by relatively inexpensive AAA batteries instead of lithium batteries. The Bushnell Holosight began appearing on the rifles and shotguns of hunters who were fond of its unlimited eye relief and quick target acquisition. As it was parallax free and offered unlimited eye relief, it made its way to handguns in IPSC (International Pistol Shooting Confederation) competition in the unlimited class, replacing the Aimpoint in many instances. The Bushnell Holosight had potential in areas beyond the shooting sports such as military and law enforcement use, but as it was designed it was not very robust to stand up to the tortures of a hard use environment. A company based in Ann Arbor, Michigan named EOTech acquired the rights to the design of the Bushnell Holosight in 1998. EOTech revamped the Bushnell design and incorporated a rigid aluminum housing to protect the sight from the rigors of the battlefield. EOTech calls this housing “the roll bar”. EOTech also incorporated a quick release mount, enabling the sight (dubbed the EOTech 553) to be fully compatible with the Picatinny rail systems found on most rifles, carbines and machine guns in modern usage as opposed to the Weaver system found on the Bushnell Holosight. The modern holographic weapon sight is most closely associated with EOTech, who set the standard for other manufacturers to follow.